Bus from Mersing to Johor Bahru is one of the important services in Mersing Bus Terminal. Besides serving the locals, it also serves tourists returning from Tioman Island to Johor Bharu and Singapore. S&S International Express, Transnasional and Plusliner are few bus operators serving bus from Mersing to Johor Bahru. Many travellers like to travel with these bus operators because of their reliable service and punctuality. S&S International Express is the dominant player in this bus service by having up to 4 daily departures. The combined trips have total up to 9 daily trips from morning 7:45am until evening 07:15pm. The bus fare for bus from Mersing to Johor Bahru is the range of RM 12.70 to RM 17.60, depending on your selection of bus operators. Duration required for bus from Mersing to Johor Bahru takes about 3 hours, depending on traffic and weather condition on the departure day. The boarding point in Mersing is Terminal Bas Baru Mersing and the arrival point in Johor Bahru is Larkin Bus Terminal. After leaving Mersing Bus Terminal, the coach will take the route which passes by Kota Tinggi before terminating at Larkin Bus Terminal. Apart from serving locals travelling between Johor Bahru and Mersing, the service also serves passengers from Singapore. 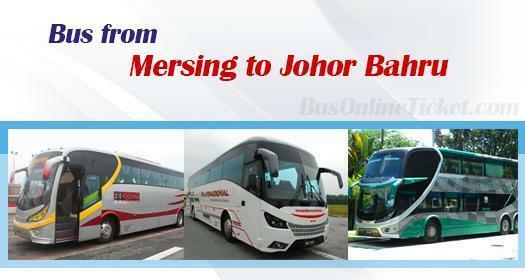 Many Singapore based customers take bus from Mersing to Johor Bahru when the direct bus from Mersing to Singapore is fully sold out. Upon arrival at Larkin Bus Terminal, they could transfer to shuttle bus plying between Larkin Bus Terminal and Singapore Woodlands Check Point. BusOnlineTicket.com is a hassle-free online booking portal to allow you to book bus from Mersing to Johor Bahru with just one click away. Upon the payment is made, BusOnlineTicket.com will send instant booking confirmation to passengers.